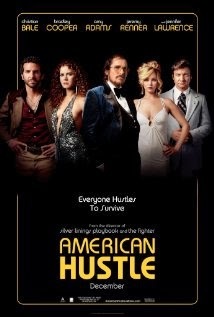 American Hustle is a crime drama directed by David O’Russell (Silver Linings) and stars Christian Bale, Amy Adams, Bradley Cooper, Jeremy Renner and Jennifer Lawrence. It tells the story of two con artists (Bale and Adams) who are forced into the biggest con of their lives when they are entrapped by a crazy FBI agent trying to further his own career (Cooper). This movie instantly reminds you of a Scorsese masterpiece. With outstanding performances by the cast I can see this being a massive hit at the Oscars. The two stand-out performances for me were Christian Bale as the pot belly, greasy comb-over con. You would not even recognise Gotham’s finest until the end of the movie when the glasses come off and the second was Jennifer Lawrence who I think should get another Oscar for her performance as his long suffering wife Ros. My only complaint would be that she did not get enough screen time during the movie. She provided some hilarious moments. Amy Adams played the part of the seductive partner to Bale very well but I just could not get used to her in a role like this and just kept hearing singing ‘The Happy Working Song’ from Disneys Enchanted in my head. Cooper is excellent as the crazed FBI agent and provided much of the comedy in the movie particularly with his tight curlers for his hair. Watching this brought me back to the first time I seen the likes of Casino and Goodfellas. It had such a compelling storyline that had me hooked from beginning to end. GO SEE IT!!!!!! !